Batgirl at Super Hero High was our first DC Comics experience. The girls had never shown interest in comic books, and I honestly hadn't thought much about this reading option. I am glad that we ventured into this new realm of storytelling though because they were drawn into the story especially my nine year old daughter. We were able to learn about Batgirl and all the other super heroes through Lisa Yee's unabridged audio version which was performed by Mae Whitman. Batgirl isn't like most of the students at Super Hero High because she wasn't born with any special powers nor did she come from a special planet like Super Girl. Batgirl is actually the daughter of Commissioner Gordon who is the police commissioner of Gotham City. I don't know much about the comic book world and as I stated this was my daughters first experience too, but we all caught on pretty quickly. We learned who the big players are in the super hero world. Lisa Yee is very descriptive and doesn't leave any rock unturned which makes it easy for the comic newbie to jump right in. Batgirl at Super Hero High introduces a new super hero, Batgirl, who was formerly known as Barbara Gordon. Barbara has to learn to balance who she was/is with her new identity as a super hero all while fighting an envious villain and not stressing her dad out too much. The story is full of action since there is often a disaster happening with Harley Quinn's "Harley-grams", a bit of mystery since no one knew how the "Harley-grams" were always causing destruction, and it reminds the listener to be aware not only of your surroundings but of human cues. We enjoyed listening to 4.5 hour audio version as we ran our errands so much so that when the story ended my daughter promptly asked when are we getting the next one in the series. 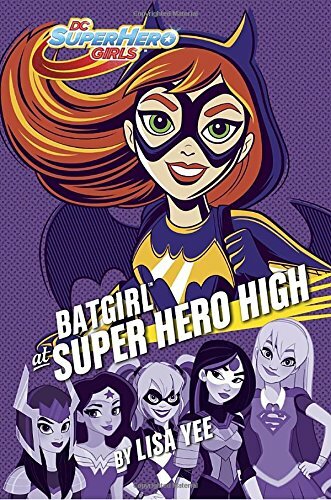 I received the Batgirl at Super Hero High at no cost from Blogging for Books in order to facilitate this review.